In May 2006, City captured the North Riding Senior Cup for the 10th time in the club’s history with a 3-1 win over Northallerton. Previous triumphs had been against Middlesbrough (1950 (winning 3-0 at Ayresome Park (07/04/50), 1979), Scarborough (1957, 1996, 2000), Billingham Synthonia (1970), Whitby Town (1986, 1999) and Stockton (1989). City were also involved in the competition's biggest crowd when 12,500 flocked to the Riverside Stadium in 1997 to witness the Middlesbrough debut of Italian star Fabrizio Ravanelli as the home side triumphed 3-1. 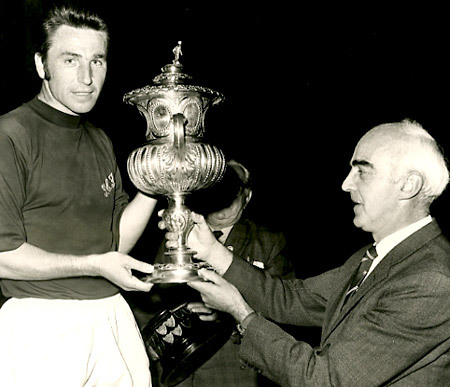 The Teessiders also beat City in the 1955 final with a certain Brian Clough getting the only goal of the game. As its name suggests, it is the senior county cup competition for Yorkshire’s North Riding that pre-dates today’s North Yorkshire. Historically, it featured the county’s 2 Football League clubs, Middlesbrough and York, entering at the quarter or semi final stage and a host of non league clubs. Historically, Scarborough being the leading side, but including various works based teams such as ICI (Middlesbrough) and Rowntrees (York) along with the likes of polytechnic sides (e.g. Cleveland, Teesside & South Bank), Whitby, Pickering, Northallerton and others. Fixture dates determinded the strength of the leading sides, sometimes first team, but more likely reserve or junior sides. For many years, it was the only chance for City and Sacrborough to meet in competitive football. In theory, we could be drawn against a local York amatuer side, in practice I do not recall such a game. Like The FA Cup, the minnows start out with qualifying rounds, the big boys (City (yes, the big boys) and Middlesbrough) usually join at the last 8 stage. However, over the years we have played the likes of Stocksbridge, Billingham Synthonia, ICI, Skinnington Iron And Steel Works, Scarborough Penguins and South Bank (Middlesbrough). Although no age restrictions on sides, City usually put out a reserve or youth based sides, however, City have been known to put out a stronger side, especially in later rounds. It suffered from floating timescales, sometimes pre season, others late season and was even abandoned when lack of interest or time prevailed. On Tuesday May 2 , 2006, YORK City's baby-faced North Riding Cup final winning team put forward convincing arguments for the continuation of youth and reserve team football at KitKat Crescent last night. Goals from teenage trio Alex Rhodes, Neale Holmes and Chas Wrigley secured a 3-1 victory over promoted Northern League first division outfit Northallerton Town at KitKat Crescent to mark the end of the 2005/06 season with silverware. It was also a performance full of promise with Colin Walker's side containing eight trainees from the club's youth programme, which the club have expressed a commitment to keeping despite the withdrawal of £69,000 in funding received over the past two seasons from the Football League, Premier League, FA, PFA and Sport England. Encouragingly, the young Minstermen looked comfortable and sensible in possession throughout the match against their older and stronger opponents with midfield playmaker Holmes particularly catching the eye, scoring an excellent goal during a tidy display. City went ahead on nine minutes when Rhodes chased a long ball over the top of the Northallerton defence and drilled a low shot past 'keeper Sam Dobbs. Northallerton right-back Simon Kasonali then went close with a free kick at the other end before Holmes extended the Minstermen's lead on 23 minutes when Bryan Stewart's cross from the right was only cleared as far as the penalty box. Holmes took one touch to control the ball before sending an impressive dipping effort into Dobbs' top right-hand corner. Dave Merris almost added a quick third with a driving 40-yard run into the visitors penalty box and Stewart also saw a low shot fumbled behind at his near post by Dobbs. City's youngsters were not as dominant during the second period and Northallerton reduced the deficit on 79 minutes when goalkeeper Arran Reid spilled a corner and substitute Craig Skelton found the roof of the net from 15 yards. Stewart should have replied on 82 minutes but made a hash of his attempted lob after being sent clear on goal by Holmes. The Minstermen ensured victory four minutes later, however, when a brave run and cross by Nathan Kamara, who colliding into the advertising hoardings and injured himself in the process, led to Wrigley firing into the roof of the net from six yards. York City: Arran Reid, Nathan Kamara (Michael Walsh, 87), Darren Hollingsworth, Mark Hotte, David Merris, Bryan Stewart, Byron Webster, Neale Holmes, Anthony Taylor (Danny Phillips, 81), Chas Wrigley (Mark Holt, 90), Alex Rhodes. Subs not used: Andy McWilliams, Liam Shepherd. Goals: Rhodes 9, Holmes 23, Wrigley 86. Northallerton Town: Sam Dobbs, Simon Kasonali, Dominic Gamble (Craig Skelton, 75), Andrew Swalwell (Dane Wilson, 21), Stuart Jackson, Michael Waller, Graeme Williams, Steven Cochrane, Carl Chillingsworth, Ross Diamond, Karl Charlton (David Cooke, 87). Subs not used: Paul Curry, Paul Burton. Skelton 79. Admission was £6, less than half of the normal price that season. Footnote: At the end of the 1954/5 season, in recognition of City's FA Cup exploits, City were invited by The East Riding FA to play Hull City at Boothferry Park in the East Riding Invitation Cup. 8,958 saw a goalless draw, both clubs held the trophy for 6 months. City were invited to play Hull for the cup a year later, winning 7-4 on aggregate, 8,881 saw City beat Hull 5-0 in the home leg.